The only daughter and second child of the late Princess Margaret, (younger daughter of King George VI and Lady Elizabeth Bowes-Lyon) and Antony Charles Robert Armstrong-Jones, 1st Earl of Snowdon, (the son of Ronald Owen Lloyd Armstrong-Jones and his first wife, Anne Messel, later Countess of Rosse) Sarah was born on 1 May, 1964 at Kensington Palace, London and was christened Sarah Frances Elizabeth Armstrong-Jones. After a long period of estrangement, her parents were divorced in May, 1978. Sarah is currently fifteenth in the line of succession to the throne. She has an elder brother, David, Viscount Linley, who precedes her in the line of succession and a half-sister, Lady Frances Armstrong-Jones, the daughter of her father's second marriage to Lucy Mary Davies. She was educated at Bedales Boarding School in Hampshire, the Camberwell School of Art and studied further at Middlesex Polytechnic College. 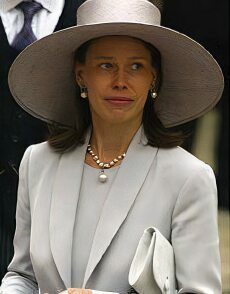 Lady Sarah Armstrong- Jones married the actor Daniel Chatto, the son of Robin Fox, (half-brother of the actors Edward and James Fox) and Ros Chatto, a theatrical agent, on 14 July, 1994. Samuel David Benedict Chatto, born on 28 July, 1996. Arthur Robert Nathaniel Chatto, born on 5 February, 1999. Her mother, Princess Margaret died in February, 2002 at the Edward VII Hospital for Officers after suffering a long period of ill health and a series of strokes. Sarah and her brother David were by her side. Sarah, who is close to her aunt, the Queen, likes to keep a low profile and is at present a professional artist. She submitted paintings anonymously to the Royal Academy's Summer Exhibition in 1996.